On May 10, 1857, The Indian Mutiny also known as the First War of Indian Independence and the Sepoy Rebellion broke into open rebellion. The spark for the mutiny came with the introduction of the Enfield rifle that used a cartridge rumored to be greased with a mix of beef and pork fat, which would defile Indian soldiers. By June 30, 1857, the siege of Lucknow began in earnest with about 8000 mutineers laying siege to the Residency and defenses surrounding it. The British commander of Lucknow, Henry Lawrence, had enough time to fortify his position inside the Residency compound. British forces numbered some 1700 men, including loyal sepoys. The rebels initial assaults were unsuccessful, and so they began a barrage of artillery and musket fire into the compound. Lawrence was one of the first casualties. The rebels tried to breach the walls with explosives and bypass them via underground tunnels that led to underground close combat. After 90 days of siege, numbers of British were reduced to 300 loyal sepoys, 350 British soldiers and 550 non-combatants. This action quickly became known as the Siege of Lucknow. On the September 25 a relief column under the command of Sir Henry Havelock fought its way to Lucknow. 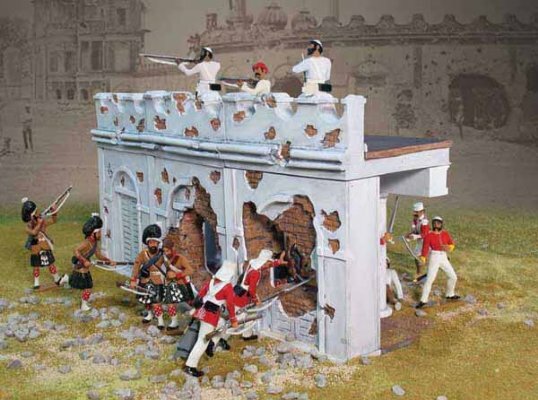 This became known as 'The First Relief of Lucknow', as this force was not strong enough to break the siege or extricate themselves and so was forced to join the garrison. In October another, larger, army under the new Commander-in-Chief, Sir Colin Campbell, was finally able to relieve the garrison. The largest number of Victoria Crosses awarded on a single day was twenty-four, for the actions on November 16. Many of the VCs were awarded to the 93rd Highlanders and 53rd Regiment for their part in breaking through a breech in the wall of the Secundra Bagh palace, killing about 2000 rebels and capturing this stronghold. On the 18th of November they evacuated the city. The siege lasted for 148 days.